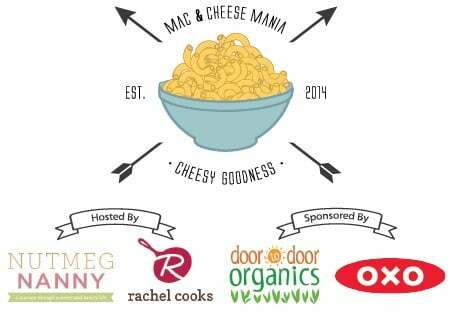 I am so excited to tell you all about Mac and Cheese Mania! My bud Brandy of Nutmeg Nanny and I have been planning this events for months partly to celebrate our blog anniversaries (my blog turned three this month!) but mostly to celebrate our love of all things cheese and mac. Clearly this is something to be celebrated. Grab a cup of coffee because there’s a lot of info (and a lot of mac & cheese) in this post! Sorry about that but it is all super important! So here’s the deal about Mac and Cheese Mania. Each day this week, Brandy and I will be posting new Macaroni and Cheese recipes. I kicked today off with a copycat Panera Macaroni and Cheese recipe. It’s creamy, delicious, and can be made in ONE PAN! Win-win-win. But we don’t just want to bombard you with amazing cheesy creations, we want you to get involved! We’ve teamed up with some great sponsors to make this event a success. Using the link-up tool at the end of this post, you’ll link up your favorite mac and cheese recipe (you don’t have to be a blogger to enter — details near the bottom of this post). Just by linking up your recipe, you’re entered to win one of the prizes! You can read all about the fabulous prizes in this post…just keep on keeping on…the details are all here! You have two weeks to link up recipes so you can even create a recipe, post it on your blog, and then link it up! You may enter up to four recipes. And you can get creative! Mac and cheese burgers, mac and cheese pizzas, mac and cheese muffins, dessert mac & cheese, whatever your little heart desires! As an added bonus, if you are a blogger, we’ll be pinning many of these recipes to our Mac & Cheese Mania Pinterest board! Follow Rachel Cooks | Rachel Gurk’s board Macaroni & Cheese Mania on Pinterest. Now, take a look at our great prizes and sponsors to see what’s in this for you –over $1,800 in prizes! Then keep on scrolling for details on how to enter! 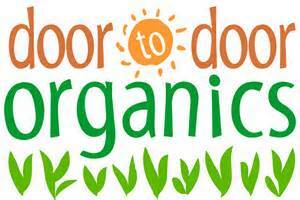 May I start by saying that I’m completely obsessed with Door to Door Organics? I’m thrilled to have them sponsoring Mac and Cheese Mania. I get their weekly deliveries (paid for with my own $$$!) and I just LOVE it. Not only does it give me the mid-week burst of produce to get me through the week and avoid another grocery store trip, but the quality of the produce is so amazing. Some of the best looking fruits and vegetables I have ever seen. Keep an eye out for a mac and cheese recipe using rainbow chard that I got in my Door to Door Organics delivery. Follow Door to Door Organics on Twitter, Facebook, and Instagram! You can also find great recipes on their site. If you’re new to Door to Door Organics, sign up and make sure to use coupon code RACHELCOOKS for $10 off your first box! You won’t regret it. Seriously, it’s the best produce. It’s like Christmas every time a box arrives. By entering your mac & cheese recipe, you could win one of three $100 gift cards to use for a Door to Door Organics delivery! (Must be in delivery area.) Door to Door Organics is offering up a $100 gift cards to three lucky winners! We are also thrilled to have OXO sponsoring Mac and Cheese Mania. 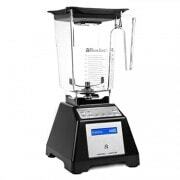 The quality of their products is second to none and they make a gadget for your every need. You would see this brand everywhere you looked in my kitchen — I love their products. And wait until you see these awesome prizes! Two amazing prize bundles worth around $150 each. Keep an eye out this week for a couple of these to be highlighted in one of my mac and cheese posts. Follow OXO on Facebook, Twitter, Pinterest and Instagram. Wanna know what’s up for grabs? 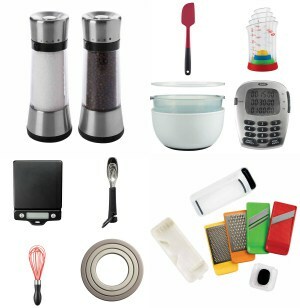 Lua salt and pepper grinders, medium silicone spatula, 4 piece mini measuring beaker set, 3 piece large bowl and colander set, triple timer, 5 pound food scale with pull-out display, stainless steel spice jar measuring spoons, 9″ silicone whisk, three ring trivet set and a compact grate & slice set. Who wouldn’t want all that??! 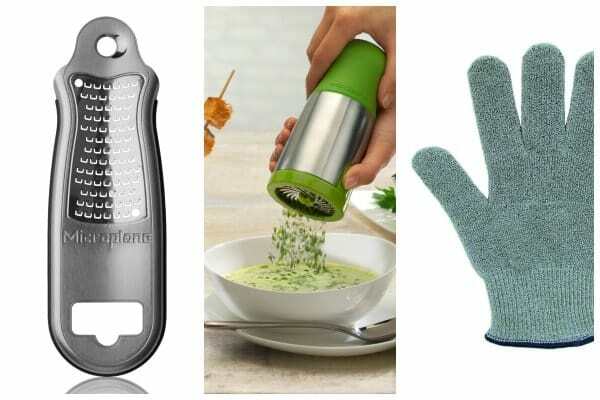 Enter to win Microplane Graters and Kitchen Tools – includes Graters, Cut Resistant Glove and Herb Mill. This prize is valued around $50. Wüsthof knives. Sigh. They’re on my wish list. But you could win this great CLASSIC studio block! 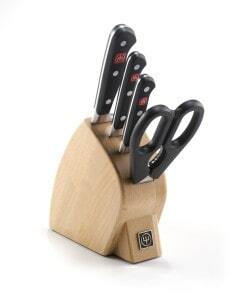 It includes 3 knives, kitchen shears, and a compact wood storage block — a $150 dollar value! By linking up your macaroni and cheese recipe you’ll be entered to win this fun and colorful Rachael Ray Stoneware Casseroval – 4.25 Qt. Covered Oval Casserole — valued at $50! 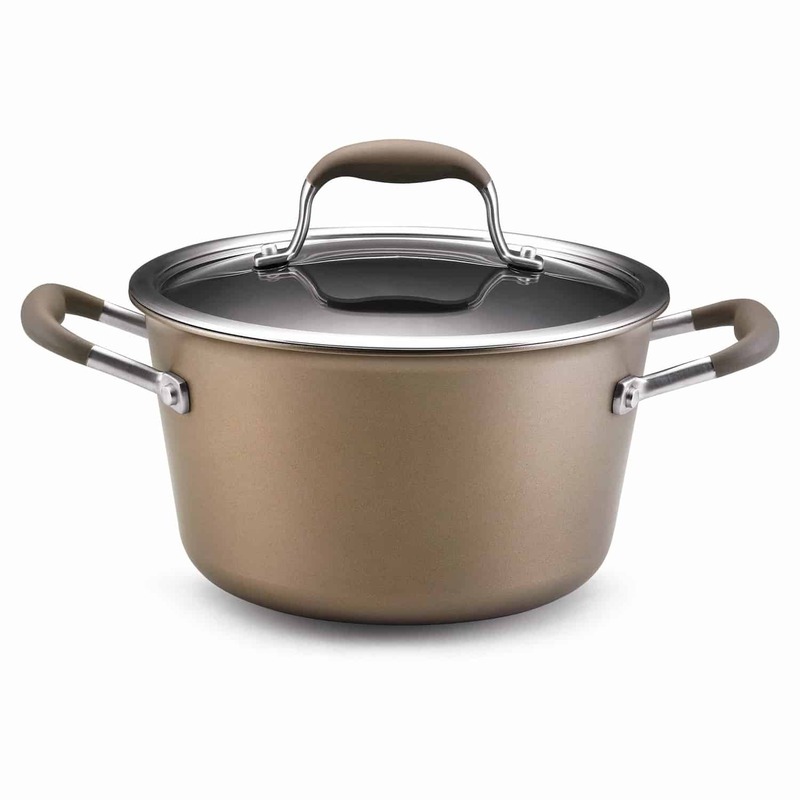 By linking up your macaroni and cheese recipe you’ll be entered to win this Anolon Advanced Bronze 4.5 Qt. Tapered Stockpot – a gorgeous and versatile pan. Anolon pans are such high quality. This stockpot is valued at $50. Our friends from Spiceologist are contributing an absolutely gorgeous Spiceologist Block (starter) with spices — valued at 139.95! 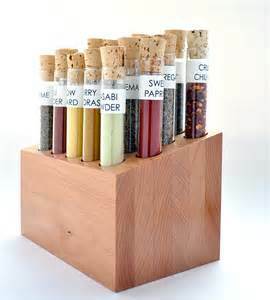 This work of art will keep your spices right where you need them — next to the action! If you’re looking for a unique food item, Marx Foods should be the first place you look. From fancy pastas to truffles to meats and seafood, Marx Foods has it. 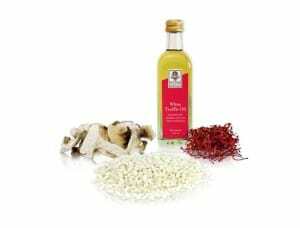 By linking up your recipe, you are entered to win a Risotto Kit valued at $54! My friends over at Zak have such fun dishes to serve up all your macaroni and cheese in, including their new microwave-safe line. (Perfect for the DIY Easy Mac I have coming later this week!) By linking up your recipe, you’re entered to win 4 plates, 4 bowls and a pretty trivet! Valued around $45. Cabot has offered up an awesome prize! When you link up you will be entered to win a YEAR of cheese! That means that once each quarter (for a year) you will get a big box (13 pounds to be exact) of Cabot cheese — the variety of your choice. Bring on the cheese! Valued at $312. Perfect for housing that baked macaroni and cheese! 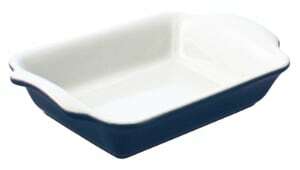 Up for grabs we have a set of Tendance Swissmar bakeware which includes a small, medium and a large baking dish. Valued around $150. This gift basket from Vermont Creamery is packed full of cultured butter, creme fraiche and goat cheese. If you’re a fan of cheese, you’re going to love this prize! Valued around $50. You can’t have macaroni and cheese without PASTA! 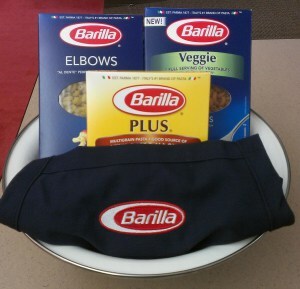 If you like Barilla pasta you’re going to love this gift basket. Up for grabs are 2 prizes– each one includes a box of original Barilla pasta, Barilla Veggie, Barilla Plus, a Barilla apron and a colander. Each prize pack is valued at $25. Find a macaroni and cheese recipe on your blog or create a newly developed recipe — you have two weeks! (If it is an older post, make sure to follow step #2 and you MUST still link back.) 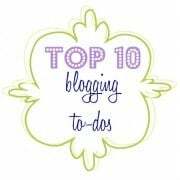 If you don’t have a blog — read step #4! Add your link to the Mac & Cheese Mania inlinkz link-up widget on either my site or Nutmeg Nanny (only do it on one site). Then, use the giveaway widget to confirm you entered and also earn extra entries. You must enter one to be eligible to win but you may enter up to 4 macaroni and cheese recipes. If you don’t have a blog — you are still eligible to win these awesome prizes! Leave your recipe or link to your favorite mac and cheese recipe in the comment section of my site or Brandy’s during the link-up (ends March 9th, 2014) and tell us why you love it. Then, use the giveaway widget to complete your entry. If you have any questions — you know how to contact me. Link-up will be open through March 9th, 2014 at 11:59pm EST. Winners will be announced that week. All winners will be selected randomly and will be notified via email. They will have 48 hours to respond. All giveaways open to US residents over the age of 18. Door to Door Organics gift cards only available to those in the delivery area. 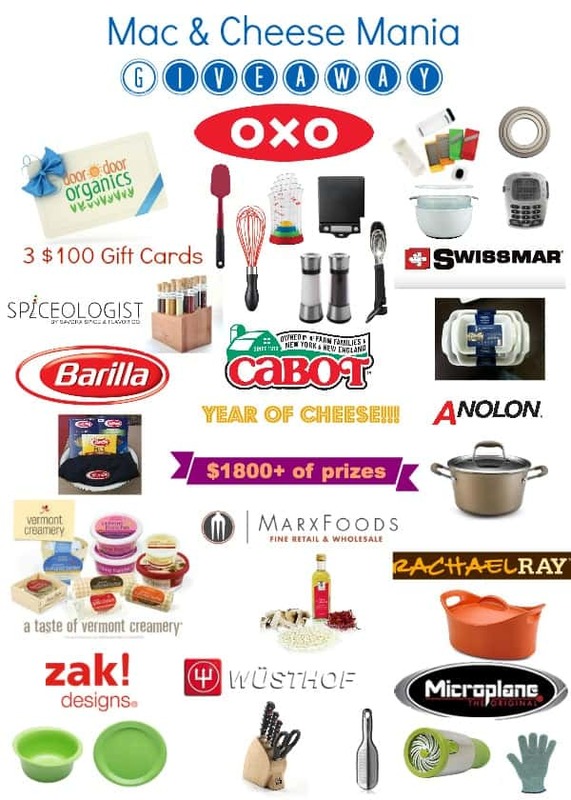 Disclaimer: Thank you to OXO and Door to Door Organics for providing compensation and prizes for Mac and Cheese Mania. Thank you to our other sponsors for providing prizes. All opinions as always are my very own. Thanks for participating! I’ve had the Anolon Advanced Bronze Hard Anodized Nonstick cookware set for 5 years and love it. The nonstick surface cooking results are excellent and it’s a cinch to clean. I have sautéed and grilled meats and fish; simmered batches of soups and stews; and prepped hundreds of breakfasts. This product delivers every time. The non-stick surface on my pans looks like new, except one small skillet that I practically use every day is slightly darkened but after 5 years it’s been beat up–but it’s still completely non-stick and does a fabulous job (I’ve always used plastic cooking utencils with this set.) I’ve always washed mine by hand, as recommended, and strictly observed the oven temp requirements when putting it in the oven. In short, I love the Anolon product. I’m currently ready to change to the Anolon Advanced Copper Core Stainless which is dishwasher safe–I’d like to have cookware I can pop in my dishwasher. 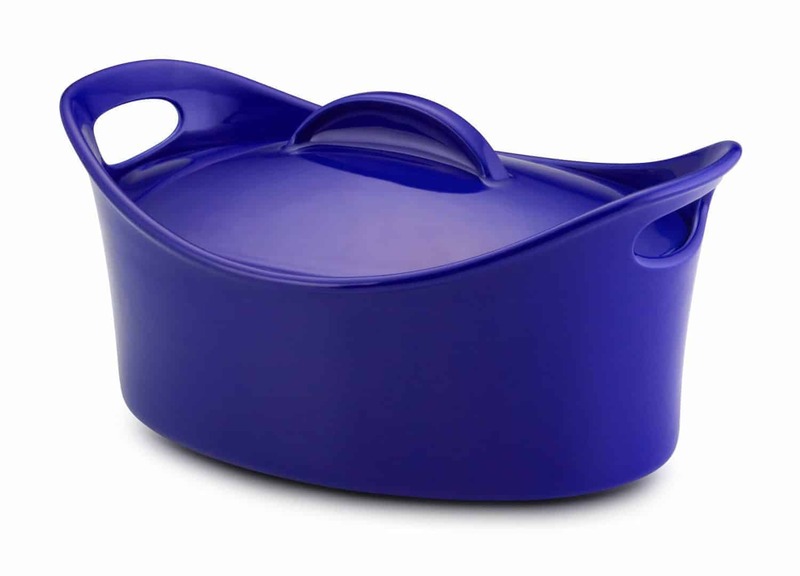 But overall this Anolon cookware has been outstanding. 4 small (4oz) or 2 large lobster tails cut into fairly large pieces and cooked about half way through in a pan with a pat of butter. It will finish in the oven. 1/2 cup more no salt butter, melted + 2 TBLS to cook lobster in. Smoke your pasta in a stove top smoker or regular smoker if you have one. It will brown just a little but that’s what you want. Remove from smoker, set aside. Cook up your lobster tails in butter or olive oil until about 1/2 way cooked… it won’t take long at all so don’t over cook it, it will finish in the oven. Season lobster with salt, pepper and garlic powder. ( old bay seasoning if you care to) to taste. Boil a large pot of water seasoned with salt and add your smoked pasta (yes, it will keep the smoke flavor after it’s boiled )Boil until it has a slight bite still. It will finish in the oven and soak up all that yumminess in the cheese sauce. Set pasta aside. Warm the milk in a pot but not boiling.. just warm and keep warm while you add the 1/2 stick butter in a large pot or deep pan. Once melted, add the flour and stir for approx. 5 mins. to rid that flour tatse. Add in the warm milk, continue to whisk as you add 1 cup of cheese at a time. Once all your cheese is melted. Mix in cream cheese until melted and continue heating until it’s smooth. Add the cheese sauce to the smoked pasta and lobster. Mix together Panko crumbs with 1/2 cup more unsalted butter then sprinkle on top of mac and cheese. Place in a 350 degree oven for approx 30 mins until your Panko crumbs are brown and crispy and the mac and cheese is hot throughout. Remove from oven and let sit for 10 mins before serving. I know you want to eat it now but you can wait 10 more mins..lol Serve and enjoy! :) Happy cooking! Pingback: Smoked Salmon + Smoked Gruyere Mac & Cheese | Super Nummy, Yo! I’ve heard Patti say, on several different show, that Elton John loves this macaroni and cheese. Denise’s Macaroni and Cheese–I modified this recipe **a lot** from one I found in the newspaper years ago. I’m using the original directions–with some additions/alterations–but I’m telling you what I do, too. Heat oven to 350. Melt 1/4 C butter in saucepan over medium heat. Add flour, salt, paprika, mustard, and pepper (and optional nutmeg), stir well with a whisk. Cook at least one minute (takes the flour taste out and makes a nice roux for the bechamel). Stir in milk slowly. Reduce heat to low (which I never do) , stir constantly, until thickened (should coat the back of a wooden spoon)–make take up to 15 minutes. Remove from heat and stir in cheese until melted. Then stir in pasta–I usually just do that in the 13×9″ pan. Bake, covered, 20 min. ** Melt remaining butter and add crumbs. Remove cover and sprinkle crumbs. Bake uncovered, until top is golden and bubbly, about 20 minutes. **If you’re in a hurry, which I usually am, just put the crumbs on and bake it uncovered for about 25 minutes total–tastes pretty much the same. I never have leftovers because I have two teenage boys, in addition to a husband and an 8yob. But, this is supposed to yield 6-8 servings. Thanks so much for hosting this event Rachel, and for including me. It was so much fun. I’m new to homemade mac n cheese so this was great for me. I love mac n cheese! I usually take pasta (any variety, we like rotini) and boil it in the milk (saves a step later), then when the pasta is cooked, add a ton of cheese (again, any variety, we like sharp cheddar or smoked cheddar) and some mustard for a little kick. If we have a hectic evening planned, I will make this the night before, put it in a casserole dish in the fridge, and then bake it in the oven as soon as we get home for about 40 min to get everything melty and happy. YUM. Tried and true, simpler the better! What a great idea and so many fabulous recipes involving cheese! This is my go-to recipe. It is so quick and easy, and I love to play around with the types of cheese. I’ve even thrown spinach in! 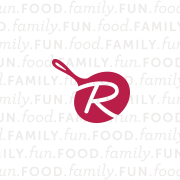 What an awesome resource for amazing mac and cheese recipes – thanks for letting me add mine! Wow….I’m not a cook so I’m not going to enter but you have fabulous prizes again. Everybody loves to win…..you go girl!! I love this Beer Mac & Cheese, but I love to add shaved Brussel sprouts. Beer and Brussels go so well together, and really take mac and cheese to a new level. It is creamy with a hint of beer and the green Brussels really pop out. I love this recipe! Nummy Nummy mac and cheese. In my opinion is the best form of “mac and cheese” because of all the parmesan! YUM! We also like to top it with grilled chicken or serve it with roasted broccoli instead of the peas. Thank you so much for setting up this awesome mac and cheese mania! It’s been such fun to participate and I’m amazed at the creativity of all of the recipes. Oh my gosh, All the Macaroni and Cheese recipes – I’m in heaven! Thank you so much for setting this all up! It has been fun creating new mac recipes, and I am now craving mac and cheese for breakfast! Good job you two! WOW. You both did such an amazing job with this. I’ll be craving mac & cheese now for MONTHS!! Big thanks to you and Brandy for putting this all together. Such a great group of bloggers and recipes. I WANT ALL THE MAC AND CHEESE! Ha. I love this gluten free version http://glutenfreecooking.about.com/od/entrees/r/gfmaccheese.htm because of the combination of cheeses. I usually used brown rice penne and then top it with toasted GF breadcrumbs. Yum! Hahahah “smackaroni and please.” Made my day. This isn’t my recipe but it is a big hit at my house and my bf’s house! This is my son’s absolutely favorite dinner. Use one package of cheese tortellini from the fresh pasta isle, 1 package (2 cup size) of Italian blend shredded cheese and half a package of pepperoni cut into quarters. Boil the tortellini according to package directions, drain saving 1/2 cup of the water. Put back into pan over low heat. Add the pepperoni and stir until hot. Add the cheese and enough of the pasta water to make it creamy. Season with salt and pepper. I know its simple, but this is what he wants after a hard day. Oh I love this idea! My daughter would love it too. It’s the only mac and cheese he will eat that doesn’t come from a box. And tge only casserole type dish too. He doesn’t like his food to touch! Sometimes it’s hard raising a special needs kid. This is so exciting! I’ve been waiting for this post! Thanks for including me! I can’t wait to go check out all the yummy recipes! Yaaay it’s finally here :) I’m going to be in heaven this week, macaroni cheese literally my favourite thing ever ;) Thanks so much for including me in this – going to go and check out all the other bloggers’ awesome recipes now! Pingback: Pretzel Crusted Butternut Mac and Cheese - Healthy. Delicious.